Depth, complexity and detail— When engaged in quality learning students are working deep in the content and working with the complexity of the concept. It is nearly impossible to have quality learning happening when the instructional focus is on coverage. The brain works best finding patterns….gaining insights…while emerged in the complexity of a topic. It is the way most learning occurs outside of school. Young children participating in an adult, complex, real life environment uncover and internalize the patterns of language. When teachers feel pressed to cover content they often work to minimize the complexity and simplify the concept for learners. This often makes the learning more difficult. 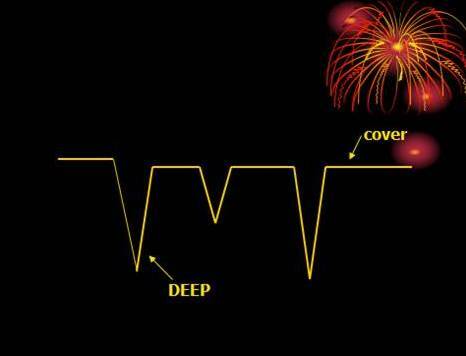 When learning is deep and complex it generally includes a great deal of detail. Ownership/ pride– When quality learning is happening the student generally has taken control of the learning event, either by the presence of choice (student decisions about what and/or how they are learning) or pride in the mastery or outcome of the learning. Student engagement at this point is often voluntary. Constant improvement– It is unlikely that quality learning happens on an initial attempt. Often student self- assessment, reflection, or teacher and peer assessment drive a desire to work longer or deeper on a task. Frequently a “start over” occurs as initial learning emerges. 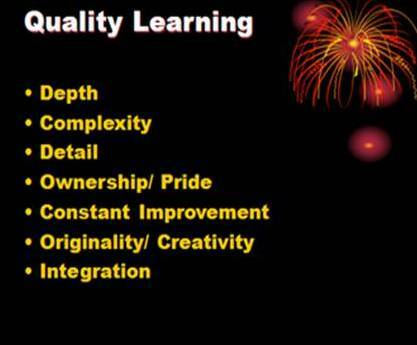 Originality or creativity– Quality learning most often occurs when the learners are constructing meaning or solutions. The construction process encourages creativity. Integration– A sign of quality learning is the integration of understanding across curricula. Different from teachers’ planning the integration of content: when students work deep, they run into other fields. A student can’t study history deeply without running into the arts or study music deeply without running into mathematics. Here is when I direct the conversation to beliefs guiding practice. Do you hold any of these beliefs and if so, how do they affect your teaching decisions? # Students may learn more (even as measured on high stakes test) if I cover less. # I can trust students brains to learn some things I didn’t cover. # Students may use what they have learned to correctly answer questions on material I didn’t cover. # Students doing and constructing is crucial to learning. # Students struggling with complexity, enhances learning. Here are two teacher decisions that emerged from a recent workshop with teachers examining these beliefs. I presented a blog post by David Ginsberg, Do More for Students by Doing Less For Students and challenged the participants with this problem that Ginsberg had given his “disinterested, repeating algebra” students. Some workshop participants used their break to keep working on the problem. 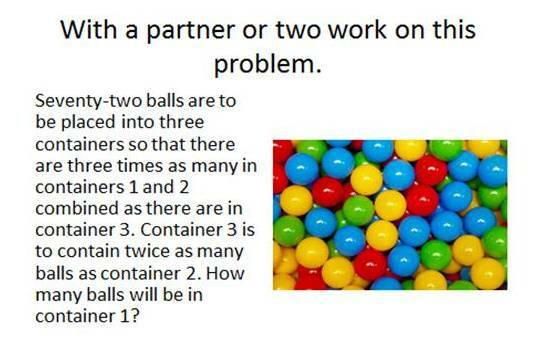 Several fourth and fifth grade teachers shared that they are giving the problem to their students in a center that has 72 balls and three containers. I am anxious to hear their findings. The day after the workshop I received this note from Jill Carden, a fourth grade teacher at Mineral Wells Elementary School in Wood County WV. Mr. Barkley, I attended your training yesterday. You talked to us about going with the flow to some degree in teaching. I had been thinking about that and was looking for teachable moments. I took my students to recess, and noticed two birds dangling from our building. They had been nesting in a hole and their legs were twisted in twine and tied together. It looked bleak! I called our principal and stated the problem. He went on the roof and cut the birds loose. I captured the birds that were tied together and another teacher removed the twine. It took a while:) The kids were gathered around and followed me to the edge of the playground and released them. They loved it! Many conversations stemmed from this encounter with nature. That science lesson was hands on. Not sure what grade level you are working with, but the door is open for an extended learning opportunity. Consider questions you might want to pose on Monday… and maybe even have questions arise from kids for further exploration…. Lots of opportunity for reading, researching, writing…..
How big of a problem is it when bird’s and man’s environment mix? What can be done to decrease occurrences? What might we do? My mind is flying, literally. I had already considered a follow up lesson on surgery, dangers of man -made items in nature. Even writing projects based on the event from the birds perspective. Had not considered the research. Wow! It is amazing how one event can lead to much more. My students are writing the principal “hero cards” and it was their idea!